RIFF JTAG Manager v1.73, RIFF Firmware v1.47 – Mass storage mode support for RIFF Box v1 | RIFF Box – Best JTAG Box in this Galaxy :) Easy to operate ! RIFF Box – Best JTAG Box in this Galaxy :) Easy to operate ! – MassStorage Mount/Dismount support for RIFFBOX1 is added. 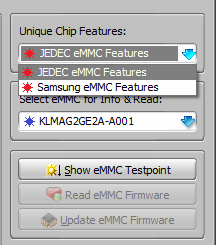 – Working with special eMMC vendor features (like dedicated Samsung eMMC Chip’s commands) is re-organized. Due to high risk of erasing User/Boot areas on the eMMC chips which are not Samsung, the Samsung chips autodetection is completely removed. To access special Samsung eMMC’s features (like firmware update, factory reset, etc) User must manually select Vendor Mode. – RIFF1 & RIFF2: Finally!!! The eMMC/SD Erase Operation (for Direct/ISP connection) finally is implemented!!! – MassStorage mount/dismount feature is reworked and improved. Now is possible to Mount/Reconfigure/Dismount the MassStorage via the same dialog. The MassStorage settings are read from the RIFFBOX, so it is much more convenient in case users need to mount/dismount same eMMC Area ocasianlly or to adjust eMMC connection parameters for better stability. – Finally!!! The eMMC/SD Erase Operation (for Direct/ISP connection) is implemented!!! – New method of resurrectors grouping is added. 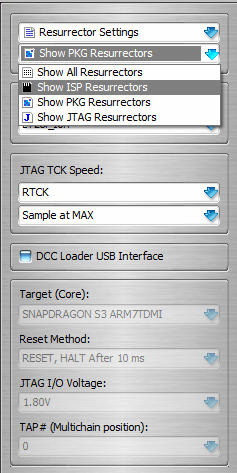 Setting ALL Resurrectors shows all available DLLs same as is done in JTAG Manager 1.71 and lower. – Fixed bug for correct setting of the recommended SD/MMC VCCIO voltage for ISP DLLs: when model is selected, the JTAG Manager adjusts the frequency, voltage and other settings to match (if possible) those values, which are hardcoded into resurrector DLL.